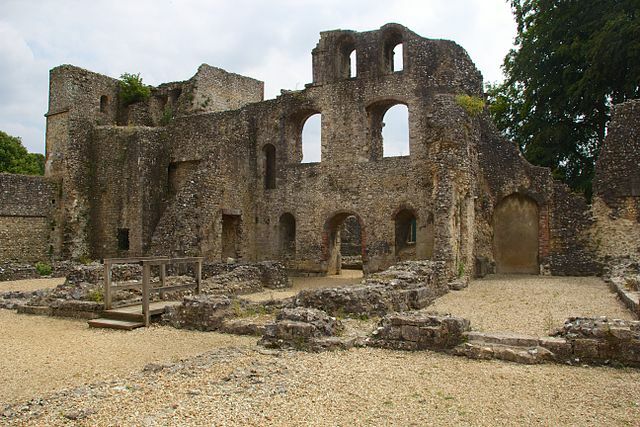 Notes: Wolvesey Castle, also known as the "Old Bishop's Palace", is a ruined castle in Winchester, Hampshire, England. It is located next to Winchester Cathedral. The castle was erected by the Bishop of Winchester Henry of Blois between 1130 and 1140. It was the scene for the Rout of Winchester in which the Queen Mathilda assaulted the Bishop Henry in 1141, during a period known as The Anarchy. The besieged defenders of Wolvesey set fire to the city, destroying most of the old town of Winchester and holding off Empress Matilda's forces until Stephen's wife, Matilda, arrived with reinforcements from London. It was once a very important building, and was the location on 25 July 1554 of the wedding breakfast of Queen Mary and Philip II of Spain. The castle was destroyed by Roundheads during the English Civil War in 1646. The chapel is the only considerable remnant of the south range of the castle, and is still in use, being attached to the palace. The extensive surviving ruins are currently owned and maintained by English Heritage. The castle has had Grade I listed status since 24 March 1950, as has the palace located on the same site.